A top US immigration lawyer has been jailed for a concerted string of identity thefts that left victims “suffering in his wake”. Raphael Sanchez – who specialised in cases concerning trafficking and war crimes – had worked for Immigration and Customs Enforcement (ICE) since 2001, latterly as its chief counsel in Seattle. It was there, from 2013 until October last year, that he used ICE databases and immigration files to obtain the personal information of the seven people, including their social security numbers, birth dates, phone numbers and addresses. Sanchez then created counterfeit identity documents in their names, affixing his photograph to the ones with male names, and a photograph of a female murder victim whose image had been published in press accounts for the identity documents that had female names, prosecutors said. Three of the stolen identities were claimed as dependants by Sanchez in his tax returns. Judge Robert Lasnik of the US District Court for the Western District of Washington handed Sanchez a four-year sentence, also ordering him to pay more than $190,000 (£140,000) in restitution costs. “Raphael Sanchez was entrusted with overseeing the honest enforcement of our country’s immigration laws,” said John Cronan, the acting assistant attorney general in the Department of Justice’s criminal division. Instead, Sanchez, a graduate of Penn State law school, “abused that trust, and capitalised on his position at ICE to exploit his victims and line his own pockets”, added Mr Cronan. Sanchez’s lawyer, Cassandra Stamm, did not immediately respond to a request for comment. In a sentencing memorandum filed last week, Ms Stamm said Sanchez admitted that he “abused a position of public trust” and defrauded people, including some who were “particularly vulnerable“. Some of the people have left the US and were not aware that debt balances were growing, prosecutors revealed. “Sanchez sold his principles for profit,” Ms Tirol added. Nearly every day, an immigration lawyer makes his or her way to a barbed-wire enclosure along Hungary’s border with Serbia, ready to walk an asylum seeker through the daunting process of pleading for safe haven in one of the most refugee-resistant countries in Europe. Now these lawyers risk jail time if they so much as help a client fill out a complicated Hungarian-language form. Hungary’s parliament last week approved a legislative package aimed not only at barring the gates to almost any outsider — but also decreeing punishment for those who try to aid would-be migrants. Amid paroxysms of immigration-related political strife in the United States — family separations at the border with Mexico, the Supreme Court’s upholding of the administration’s travel ban targeting nationals from certain Muslim-majority countries — Hungarian Prime Minister Viktor Orban, a self-professed fan of President Donald Trump, is savoring his latest and most sweeping victory in the migration wars shaking Europe. The new measures, set to take effect as early as this weekend, allow for the prosecution and jailing of human rights workers and volunteers for providing services, advice or support to migrants and asylum seekers. The package, which prompted vehement criticism from the European Union and human rights groups, could still be vetoed by Hungary’s president, Janos Ader, but such a scenario is seen as highly unlikely. Hungary has taken in vanishingly small numbers of migrants, refugees and asylum seekers, but Orban — whose populist Fidesz party swept to victory in April elections, securing him a third term — sees vindication in the Draconian anti-immigration measures increasingly espoused not only by hard-right leaders elsewhere in Europe, but also by the U.S. president. Even before the latest stringent measures, Hungary earned a reputation for hostility toward migrants who surged through Europe three years ago, a wave made up largely of Syrian war refugees trying to make their way to friendlier destinations such as Germany and Sweden. Hungary erected a barrier on its border with Serbia and Croatia; state media relentlessly bashed Muslims as a threat to Christian Hungary. A much-viewed video showed a Hungarian camerawoman tripping a Syrian man as he ran across a field carrying his child, sending him sprawling. Orban, who crowed at being the first European head of state to congratulate Trump on his 2016 election victory, sees the U.S. president as a kindred spirit. So do critics, who often portray the pair in the same unflattering light, particularly on immigration issues. Jan Egeland, the secretary-general of the Norwegian Refugee Council, tweeted last week that Budapest and Washington were seemingly in a “race to the bottom” when it came to dealing with foreigners seeking refuge from violence. Hungary has responded with defiance toward those who say Orban’s aspirations to an “illiberal state” — with moves that have included a constitutional rewrite and a crackdown on press freedom — mark a blatant break with EU norms and values. “We want to keep Hungary a Hungarian country, and we don’t think that multiculturalism is by definition good,” Foreign Minister Peter Szijjarto told the BBC this week. Orban’s government, like the Trump administration, has repeatedly cited border security and the need for anti-smuggling measures as a pretext for the newly tightened laws. And like Trump, the Hungarian leader appeals to his base with routine use of harsh, heightened language to characterize immigrants. “The invasion should be stopped!” Orban told reporters in Brussels on Thursday. Adding fuel to the fire, the EU’s internal struggles over the migrant issue have been greeted with seeming glee from Trump and Russian President Vladimir Putin, set to meet next month in Helsinki, Finland. At a moment when leaders such as German Chancellor Angela Merkel and French President Emmanuel Macron are trying to maintain a united European front in the face of aggressive trade moves by Trump and the threat of election interference from Russia, migration is perhaps the most polarizing issue confronting the bloc. Merkel, speaking Thursday to Germany’s Parliament, called it a “make-or-break” question. The battle is in many ways paradoxical. The number of arrivals in Europe has dropped off dramatically since the 2015 crisis. 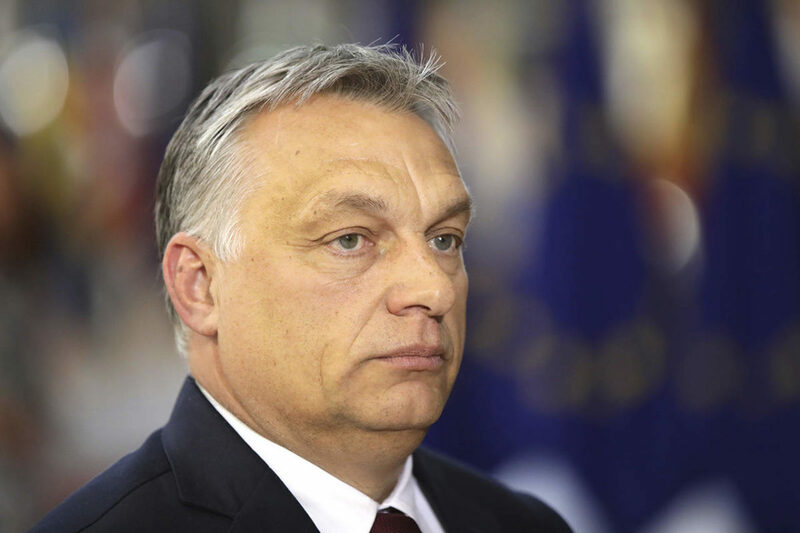 But in an echo of the U.S. dynamic of falling rates of migrant arrivals coinciding with ever more strident efforts to place the issue at political center stage, Orban has set himself up as the champion of an anti-migration faction mainly made up of countries that were satellites of the former Soviet Union. That cohort also includes a chorus of far-wing voices in countries that weren’t part of the Soviet bloc, such as Austria and Italy. One of the most vocal and vitriolic of those is Matteo Salvini, Italy’s combative new interior minister, who is also the deputy prime minister. Salvini was among the Italian officials who met Tuesday with John Bolton during the U.S. national security adviser’s Rome stopover en route to Moscow to lay groundwork for the Trump-Putin meeting. An emergency gathering Sunday by a group of leading European Union members, which was boycotted by Hungary and several other states, was meant to engineer at least a show of unity on migrant burden-sharing. Instead it showcased deep divisions, rendered all the more painful by Trump’s apparent glee over splintering of the EU and political schisms within member states that count among America’s closest allies. This month, the U.S. president shocked Germans with his open jeering of Merkel over the pressures her governing coalition faces on the migration issue, coupling his gibes with a false insistence that migrants have driven up German crime rates. Vessela Tcherneva, program director for the European Council on Foreign Relations and the head of its Bulgaria office, cited Trump’s use of “nativist, nationalistic forces” to deepen splits within the bloc as well as efforts at inroads in individual member states where his message might resonate. Orban has long proudly showcased his affinity for Trump, and the two leaders had a friendly phone call this month as a political storm gathered over the U.S. president’s since-softened policy of separating migrant parents and children at the southwestern border. Some of Orban’s critics have called for the invoking of Article 7 of the EU’s founding Treaty of Lisbon, which calls on all member states to “respect the values” of the bloc. Hungary has already been called in the European Parliament for at least a dozen democratic breaches, and the European Commission could launch a so-called infringement proceeding, which could open the way to contesting the measures in court. But a two-day EU summit that began Thursday brought more messy public acrimony, with Orban and his partisans loudly spurning calls for migrant burden-sharing. Most observers believe that at most, the bloc may manage symbolic accord on tightening Europe’s external borders and steps such as creating incentives for third countries to dissuade migrants from trying to reach Europe’s shores. In the meantime, activists say, Hungary’s new measures are likely to have a profound chilling effect, made all the worse by uncertainty, on those who try to move ahead with previously legal forms of migrant aid. “You don’t have to be convicted for this to massively disturb your day-to-day work, and your personal and family life,” said Todor Gardos, who carries out Eastern European research for New York-based Human Rights Watch. Pence tells Central American leaders to do more to stem illegal immigration to the U.S.
Vice President Mike Pence demanded that Central American nations do more to stem illicit immigration, charging that few asylum seekers from the region had legitimate claims to safe haven in the United States. “This exodus must end,” Pence told a meeting of leaders here Thursday from Guatemala, El Salvador and Honduras — which make up the so-called Northern Triangle that produces much of the illegal migration traffic to the U.S.-Mexico border. “While many claim asylum, few are fleeing prosecution,” Pence said. The comments came as the Trump administration has faced global condemnation for its now-discontinued “zero tolerance” policy, which resulted in the separation of more than 2,000 children from their families — mostly Central Americans. The U.S. vice president did not mention the family-separation issue. President Trump reversed the policy last week, but numerous questions remain about how divided families will be reunited. Pence focused on what he characterized as the shortcomings of Central American nations in failing to stem illegal immigration to the United States. For years, U.S. authorities have rejected most Central American asylum applicants, deeming them economic migrants rather than refugees fleeing persecution because of various qualifying factors — such as race, religion, nationality or political opinion. The Trump administration has reacted skeptically to the notion that people fleeing gang violence — which is endemic in the three nations — should qualify for asylum. That stance has angered human rights advocates here and in the United States. The vice president called on the Central American countries to take a number of specific steps, including increasing the ranks of border police, enhancing anti-gang and anti-corruption efforts and removing “public advertisements for human traffickers within your nations” — the last an apparent reference to travel agencies, transport companies and other firms that publicly offer to facilitate trips to the U.S.-Mexico border. There was no mention from Pence of past U.S. interventions in Central America or Washington’s past support for repressive Central American governments — a factor often cited by advocates seeking less restrictive U.S. immigration policy. Central America, once a crucial Cold War battleground, has lately figured in U.S. policy mostly because it is a source of immigrants who enter the U.S. illegally and a transshipment point for cocaine destined for the United States. Guatemala, Honduras and El Salvador are home to the bulk of Central American asylum seekers arriving at the U.S.-Mexico border. Central American migrants, including many minors, have increasingly begun to outnumber Mexican nationals illegally crossing into the U.S. Most make a long and dangerous trek through Mexico to reach the border. The vice president’s stop here continues a Latin American swing for Pence, who, while in Brazil, publicly discouraged Central Americans from making the journey through Mexico and to the U.S. border. But critics say that is unlikely to stem the flow of people seeking to escape violence in their homelands. “I think the president and the vice president should go read what’s on the Statue of Liberty again,” said Mike Donovan, president of Nexus Services, which has funded lawsuits and other efforts on behalf of children separated from their parents. Immigration advocates argue that Pence should use his meeting with Central American leaders to focus on what they called a long-neglected issue: the root causes driving so many migrants to flee their home countries. 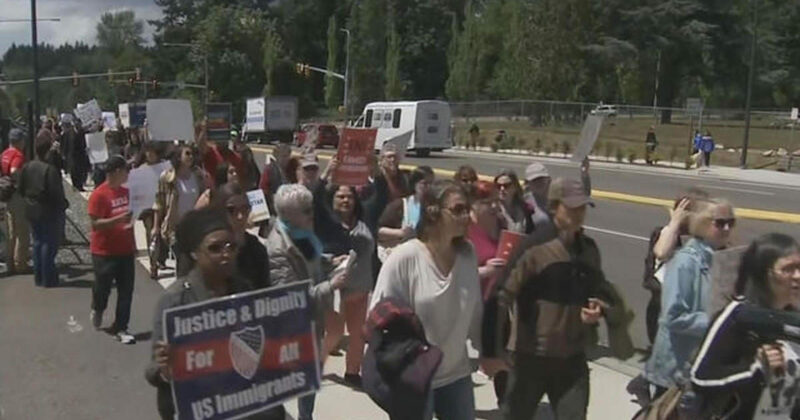 “The administration has been concentrating too long on how to stop people from entering rather than why they’re coming,” said Maureen Meyer, director for Mexico and migrant rights at the Washington Office on Latin America, an advocacy and research group. Those factors include gang violence, drug-related slayings, political killings and abysmal economic conditions. The Trump administration, however, is more likely to heed so-called immigration restrictionists, who want to reduce the number of immigrants in the U.S. and represent an important segment of the president’s base of supporters. Under the Obama administration, Vice President Joe Biden spearheaded a nearly $1-billion program for Central America that helped finance police reform and development projects. But the Trump administration is seeking to slash aid to Central America by at least a third. Trump has frequently complained that “Mexico is doing nothing” to help the U.S. immigration problem. But migrants fleeing the Northern Triangle countries are often stopped in Mexico and sent home. Mexico has detained nearly 140,000 migrants from January 2017 to April of this year, according to the Mexican government. The vast majority were Central Americans. The practice has been criticized by human rights activists who say many of the migrants are mistreated by Mexican immigration authorities and denied a proper opportunity to apply for asylum. 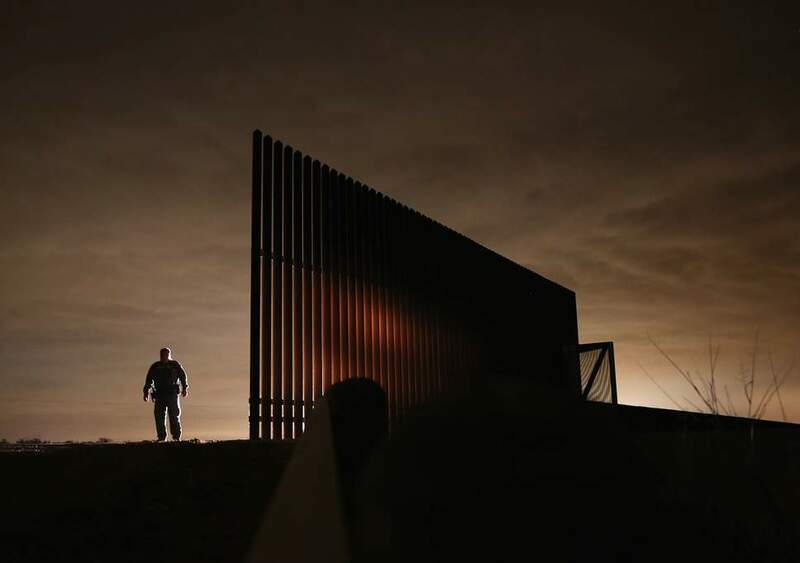 Julissa Reynoso, a former deputy assistant secretary of State for Central America and the Caribbean in the Obama administration, said that harsh penalties for crossing illegally into the United States cannot stop the flow. Author podskarbiPosted on 06-29-2018 07-23-2018 Leave a comment on Pence tells Central American leaders to do more to stem illegal immigration to the U.S.
Nearly 600 protesters, mostly women, were arrested on Thursday after they staged a non-violent action in the heart of a US Senate office building in Washington against Donald Trump’s “zero tolerance” policy towards immigrants and separation of families at the border. The mass protest was one of several demonstrations that erupted across the country, providing a taste of what are expected to be much larger demonstrations on Saturday called by the Women’s March and the Center for Popular Democracy Action. The rallies are likely to get a further boost as a result of the announcement on Wednesday by Anthony Kennedy that he is retiring from the US supreme court, providing Trump with the chance to make a second ultra-conservative appointment to the nation’s highest court and prompting fears of a rollback of liberal protections. The largest demonstration on Thursday saw the 90ft atrium of the Senate Hart office building overrun by hundreds of women who sat on the floor pumping their fists in the air. Many were draped in foil sheets as a statement on the flimsy bedding given to children and adults as they are held at US border detention facilities. The protesters chanted “abolish Ice” and “we care” – a jab at Melania Trump for wearing a jacket with the words “I really don’t care, do u?” painted on its back as she visited one of the immigrant detention centers in Texas last week. Among those arrested in the senate building were Pramila Jayapal, a Democratic member of Congress representing Seattle. She said in a video posted on social media that she had joined the action to protest “the inhumane and cruel ‘zero tolerance’ policy of Donald Trump and this administration, the separation of families, the caging of children, and the imprisonment of asylum seekers”. She added that she was proud to have been arrested among hundreds of others who believed that “the US is better and as a member of Congress I refuse to let this president and administration do what they are doing to children in my name”. Daily images are still emerging of distraught immigrant children separated from parents and not yet reunited, despite an executive order last week ending the policy of summarily tearing families apart and arresting the adults after anyone is caught crossing the border illegally. Winnie Wong, political adviser for the Women’s March, said the crowd’s fervor would translate into “the energy we will need to see to at the ballot box in November”, when congressional control will be at stake. 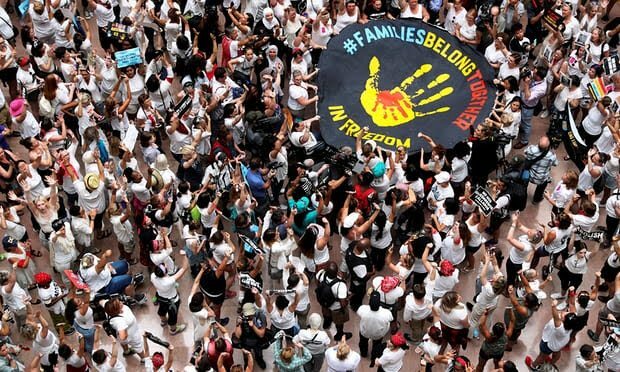 The Democratic senator Jeff Merkley of Oregon, who was one of the first to draw attention to children being held in detention camps along the border after being separated from their parents, appeared before the crowd. So did the Democrats Kirsten Gillibrand of New York and Edward Markey of Massachusetts. “These folks are out here fighting for the core principles of our nation, and I applaud them for it,” Merkley said in an interview. Meanwhile, hundreds more people gathered at a rally outside a federal courthouse in Brownsville, Texas, in the Rio Grande valley.